I started to wear glasses in second grade and wore them until I was in high school, when I was finally able to put contacts in my eyes without passing out from the fear of it. Today, I use my glasses a lot more while traveling than I do when I'm not. In case I fall asleep unexpectedly from a day of aggressive sightseeing, I take my contacts out earlier than normal when I'm away. I also wear my glasses on overnight flights so that I don't arrive in a destination with dry eyes and a headache. I don't have the best track record with glasses, breaking them in soccer games as a kid when the ball would inevitably hit me straight in the face, or in January, when I dropped a brand-new pair of glasses behind the dresser in the hotel room in Charleston. I have also had bad luck with sunglasses over the last few months while traveling - leaving a pair in a bathroom in Switzerland, losing a pair in Philly, and breaking a pair while kayaking on the East River. I was recently contacted by Firmoo, asking me to try their "global optical online store" and thought it would be a great opportunity to get myself a pair of glasses I could travel with, without risking my "good" pair that I get each year from insurance. The site has prescription and non-prescription glasses as well as a variety of sunglasses, with most frames in the $20-$40 range. I picked a hipster-like pair in black, which now appears as only available in purple and tortoise. I typed in my prescription as last received from my optometrist in April. What I didn't know was my PD, Pupillary Distance, or the distance between my pupils in millimeters. Firmoo recommended having a friend measure the distance with a ruler. Ryan determined, while at a bar, me with a ruler against the bridge of my nose, that my PD was 56. If you don't have a Ryan, you can measure it yourself in a mirror, but I highly recommend getting a Ryan. 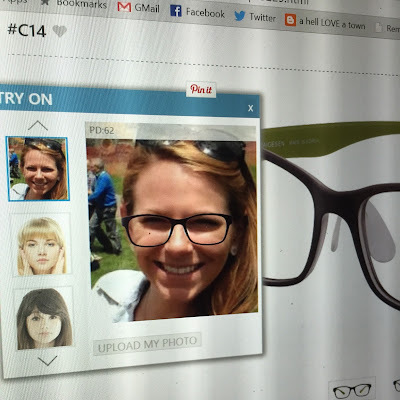 My favorite feature on Firmoo was that I could upload my photo and see what the frames would look like on my face. Since you can't return prescription lenses after they're created, this is a very important feature for an online glasses store. My custom-ordered glasses came out to a total of $40, including shipping. I received the glasses about two weeks after ordering and was tickled that they came in a glasses case printed with maps on the outside. It's as if Firmoo knew. The glasses I received work great, which means that Ryan did a good job on measuring my PD, but also that Firmoo did a good job making my lenses to the right specifications. The frames I chose are extremely light and don't appear to be as sturdy as my other glasses, but for a spare pair, they'll do just fine. Plus, this means my luggage won't exceed the weight limit. Thank you, Firmoo, for sending me a pair of glasses for this review. This link will show you Firmoo's daily new arrivals, and this link will show you all frames that are on sale. Opinions are always my own. This is the best function room in the city. The food they served was warm, fresh and tasty, and the panoramic window is a sight to behold on a clear day. The main hall at event space Chicago was similar to a club/lounge – however, it had more of an intimate feel.